Last year I went to the Supanova convention in Melbourne, where I found someone I knew helping to man a booth in their equivalent of artists alley. 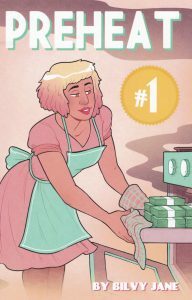 While I was chatting away, I decided it would be the right thing to do to support an indie comic book creator so I picked up Preheat #1 (by Bilvey Jay Lee), which turned out to be an interesting (if short) tale. Last weekend I went to 2019s Supanova convention where I met the same people again and bought Preheat #2. But what is Preheat all about? Is it worth reading? What does it get right and what questions does it raise? Note: This column contains essentially all the spoilers possible. You have been warned. 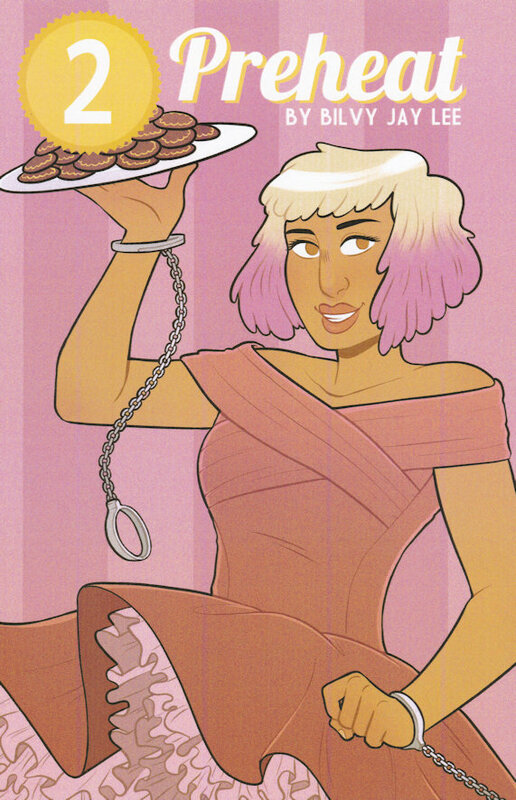 Brandy is a young, ambitious, and morally ambiguous baker, who loses her bakery in a violent fire. 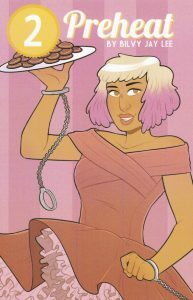 After struggling to see any of her insurance payout, she turns to smuggling illegal goods through her cake deliveries across the city, in a desperate attempt to make her money back. The blurb on the back gives the reader the general run-down on the concept but is not specific enough to ruin the morally grey (or outright immoral) nature of the characters within the two issues. The story starts with what seems to be a normal bakery with two happy employees and the boss, Brandy, going about what is normal bakery business (says me, never having worked in such a place). There is excitement regarding a ‘big day’ happening tomorrow, the nature of which is left mysterious though the reader’s natural thoughts are guided when it’s revealed that one of the employees, Hazel, is in a relationship with Brandy to believe it’s a couples related event. Indeed, Hazel and Brandy meet up and have a romantic evening but after that is done Brandy continues thinking about the big day. Next morning, Brandy is awoken to the news that her business has burned down and everything is gone. She drives to scene, along the way phoning Hazel and explicitly stating that it was herself that committed arson on her own store, and meets with detectives who are suspicious of the way Brandy conducts herself. Thinking she is in the clear, Brandy leaves the scene and celebrates the incoming huge insurance payout that is coming her way. The first issue ends with Brandy and Hazel stating their love for each other. The second issue commences with the two detectives, Hopper and Sturman, still trying to find dirt on Brandy. It would have been nice to have name plaques/signs on their desk to remind the audience of their names, as it was I had to look back to #1 in order to check. A call from the insurance company puts pressure on the detectives to either close the case or arrest Brandy, so they arrange to have her brought in for questioning while they take one last look at the ruined bakery. While there they decide that planting evidence is the only way to get grounds for an arrest, so they amateurishly leave some accelerant at the scene. The Police Captain, afraid of the publicity of arresting a lesbian without proper evidence, lets Brandy go and suspends one of the detectives for planting evidence. The decision the Captain makes is fine but the reasoning behind it is not; it’s not because it is simply the ethical thing to do, it is because he is only taking the PR consequences into consideration. However, Brandy is not in the clear as the hoped for insurance payout is declined. She is left with nothing, her scheme has failed. Hazel suggests starting the business over from scratch, though getting a bank loan and other normal approaches – however a well-off friend, Jac, promises easy money if Brandy will deliver some illegal drugs to a college campus. Brandy and Hazel jump at the chance, using the ruse of baked good delivery to drop off some illegal substances to students. The issue ends with Brandy holding a fist full of cash, her ill-gotten gains from the job. The story is clear and explains everything nicely, leaving nothing on the surface level for the reader to work out or even go back and double check. Some more character building, quicker name introductions or a more specific setting, would assist with the world building – for instance, it is not said what sort of city the narrative takes place in, or even which country it is set. While such details aren’t vital for the story itself, it does assist audiences with relating to the characters and help build credibility (especially when a story deals with plausible real life events). 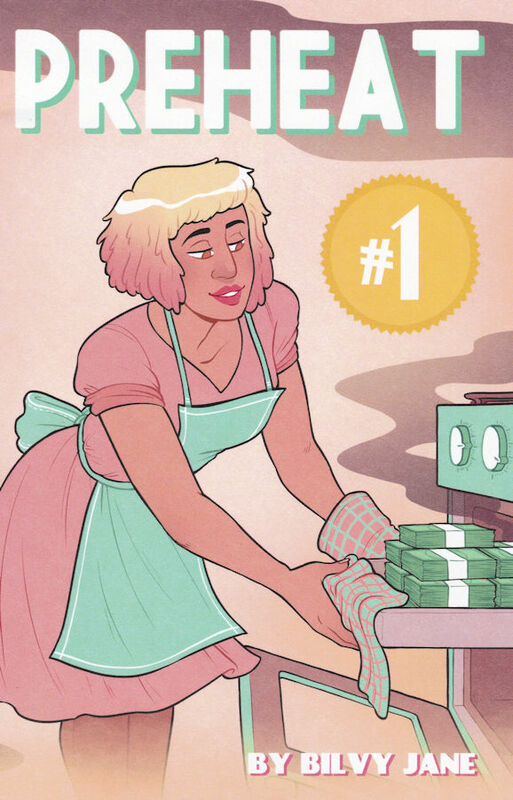 One change I would like to see is how the first issue ended, the revelation that Brandy destroyed her own business on purpose would have made a good twist ending with the rest of the issue building up the idea that she is a relatively innocent business owner just trying to get by. As it stands, the issue ends somewhat weakly with no real mysteries to lead the reader to issue 2. The illustrations are serviceable and do a generally solid job of communicating emotions and actions to the audience. Some more attention to backgrounds could be nice, with panels often left with just colour instead of details to assist world building or better construct mood. Likewise, more attention to shadows would help make settings more alive and could be thematically powerful in a morally grey story such as this. There is a notable improvement in terms of panel composition and layout between the two issues that indicates a creator who is striving to improve themselves, which is always a good trait. There are some great uses of panels to communicate the passage of time, such as at the start of issue 2 with detectives puzzling over the case. Overall, the art does what it needs to do and there are no glaring faults that negatively impact the reading experience. I would kill for an android version of Clip Studio Paint, which Preheat was produced on, however. Preheat goes into Breaking Bad territory in terms of the protagonist coming up with a get rich quick scheme that ends up blowing up in their face. That being said, while you can understand why Walter White started what he did the same can’t be said for Brandy, who seems to commit arson and insurance fraud just because she wants a better location for her bakery. There really are no characters in this story that have clean hands; Hazel happily goes along with the scheme, the detectives are crooked, the captain worries just about public relations and so on. Also like Breaking Bad, you can see the characters sinking further into crime – in just two issues, Brandy goes from the relatively harmless world of insurance fraud to actively assisting in drug deals. The lack of morals from any of the cast makes actively supporting any of them difficult but it does do a decent job of showcasing a world, much like our own, where morality is quite often questionable and absolutes are a rare commodity. As far as I’m aware, this is one of Bilvy Jay Lee’s first attempt at making an independent comic and it shows considerable promise. I was suitably entertained by the story, the art wasn’t hard on the eye and I look forward to, hopefully, seeing Preheat #3 at 2020’s Supanova convention. Should you give Preheat a go? Yes, you should. I can see Bilvy Jay Lee producing some excellent comics in the future.